Wow, it’s been a little over a month since I’ve posted, but it’s been a busy month. Early in July I decided to travel to Theodore Roosevelt National Park in North Dakota via the Badlands and Black Hills in South Dakota. When you tell most people that you’re going to North Dakota you get a strange look, but hey, I’m from Nebraska so I’m guessing that’s the same look someone would give if you told them you were going to Nebraska. 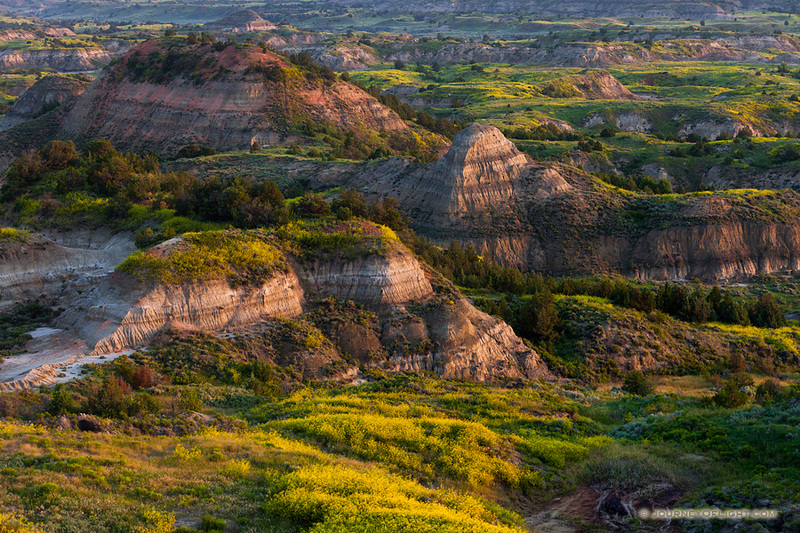 Anyway, Theodore Roosevelt National Park is in the western side of North Dakota. The geography is fairly rugged with badlands and canyons throughout the park. It is a fairly quiet area with the exception of the recently developed oil fields and the tanker trucks that barrel down the highways. 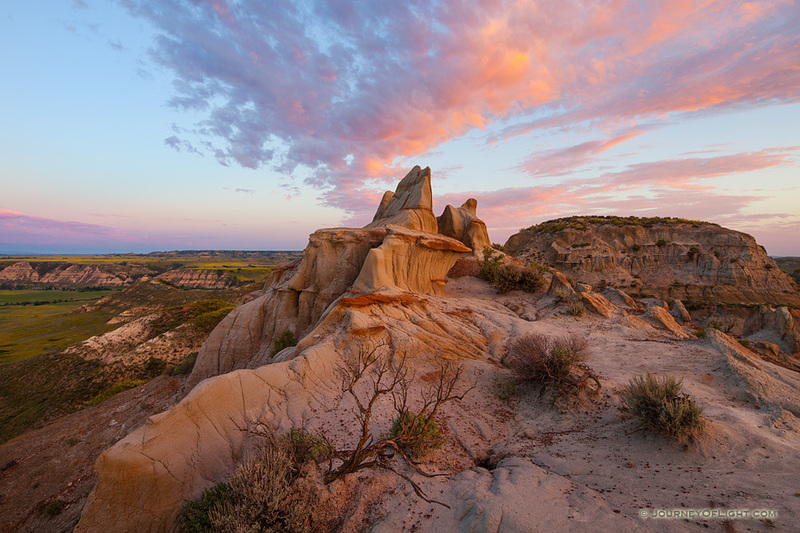 Today I’m posted a few of my landscape images captured in both Theodore Roosevelt National Park in North Dakota and Badlands National Park in South Dakota. Over the course of the next couple of weeks I’ll be posting more of my images from this trip in a series of Trip Reports. This first image was captured at the Painted Canyon lookout just off the interstate. Recent rains had made the valley lush and green when I arrived. The morning light skimmed over the rocks giving everything a beautiful warm hue and illuminated the striations and colors in the bluffs. Canon 5D Mark II, 70-200 f/4L @ 70mm, f/7.1, 1/200 sec. High on the plains, these badlands reflect the warmth of the rising sun while clouds glow orange. 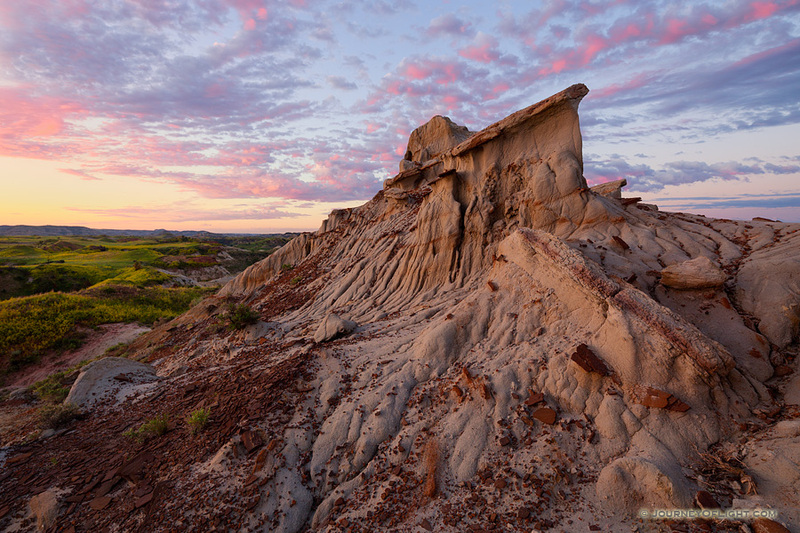 Theodore Roosevelt has a diversity of landscape including badlands like these, bluffs, plains and prairies, and river valleys. Canon 5D Mark II, 17 TS-E f/4L Lens, f/13, 1/4 sec. Another image of the badlands formations found in Theodore Roosevelt. Here, the sun has not quite risen above the horizon, but it is underlighting the clouds in the distance across the green prairie. 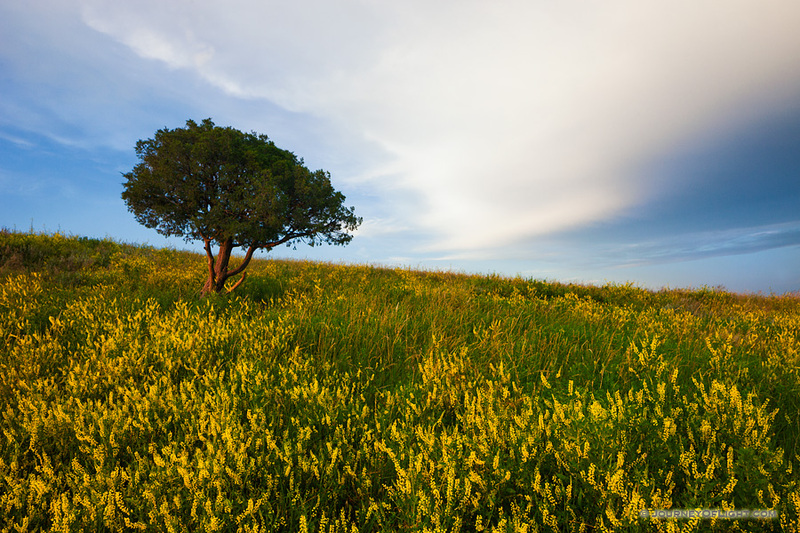 In both North Dakota and South Dakota this wild yellow clover was growing everywhere creating these beautiful yellow fields. The increased rainfall in both states was responsible for these flowers popping up all over the place. I’ve heard that yellow is the most inviting color and I just couldn’t get enough of these flowers. Canon 5D Mark II, 24 TS-E f/3.5L Lens, f/13, 1/80 sec. 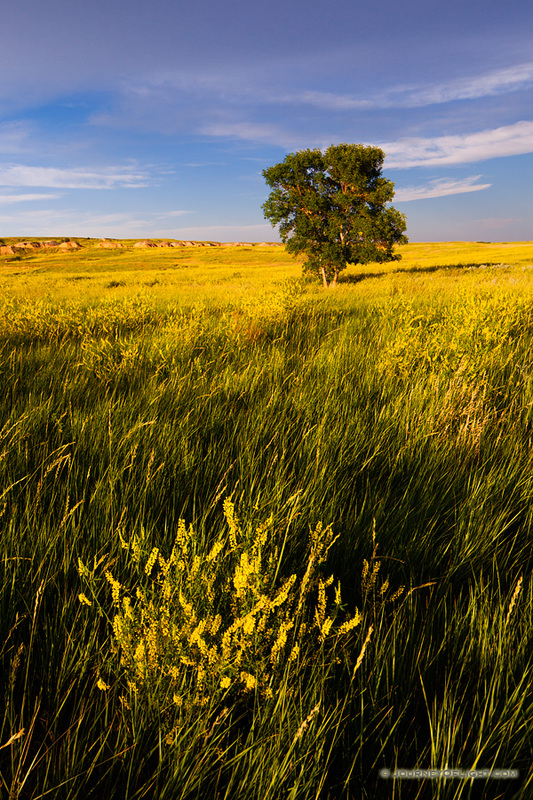 Another image from the Badlands of South Dakota and the wild yellow clover. As I mentioned above, I loved having this intense color everywhere so many of my photographs from this trip contain these flowers. Canon 5D Mark II, 24 TS-E f/3.5L Lens, f/11, 1/125 sec. 4 Responses to "Trip Report 1: Journey to the Badlands of North and South Dakota – Landscapes"
Nice set. It looks like you had a very productive trip. Yes, very productive. I had some beautiful sunrises and sunsets and some great wildlife and as I photographer I couldn’t ask for more. This definitely was worth the trip. You have captured some very stunning images. I can’t wait to see the other parts in this series. Thank you, it was a productive trip and I’m still hard at work processing images. I’ll be sharing many more very soon!